As a follow-up to my blog observations yesterday about Christians in Israel, here is a helpful piece about the diminishing population of Christians in that troubled nation. Religion plays a significant role in Israeli society, and because so many Christians around the world look to the country where Jesus lived and died as a source of inspiration, Israel’s tiny Christian community is of special interest. Four of the five most recent popes have visited Israel; Pope Francis traveled there in 2014. Christians currently make up just 2% of Israel’s adult population. Indeed, as of 2010, Christians made up a small share (4%) of the population in the Middle East-North Africa region as a whole. 1 The vast majority of Israelis who say they are Christian also say they are ethnically Arab. In this regard, they share an ethnicity with the larger Muslim population, which makes up an estimated 14% of Israel’s adult population and is almost entirely Arab. Most of Israel’s Druze population also identifies as ethnically Arab, although Druze are often considered a unique ethno-religious group. 2 Politically, Christians agree with Muslims in saying Israel cannot be a democracy and a Jewish state at the same time. About seven-in-ten Christians (72%) and 63% of Muslims take this view. Israeli Christians have political views similar to those of their fellow Arabs on several other issues as well. For example, majorities of Christians (80%) and Muslims (72%) say the Israeli government is not making a sincere effort to achieve a peace agreement with the Palestinians, and most Christians (79%) and Muslims (61%) in Israel also say the continued building of Jewish settlements in the West Bank hurts Israel’s security. And Israeli Christians (86%) and Muslims (75%) both overwhelmingly say the U.S. is too supportive of Israel. 3 Israeli Christians tend to be less religious than Israeli Muslims but more religious than Israeli Jews on key measures of religious commitment. For example, in Israel, 57% of Christians say religion is very important to them personally, compared with roughly two-thirds (68%) of Muslims and three-in-ten Jews. Israeli Christians also tend to fall between Muslims and Jews on other measures of religious commitment. About one-third of Israeli Christians pray daily (34%) and 38% say they attend religious services at least weekly. By comparison, 61% of Muslims and 21% of Jews pray every day, and about half of Muslims (49%) and a quarter of Jews (27%) report attending religious services at least weekly. 4 Israeli Christians have limited social and family connections with Jews as well as with Arabs from other religious groups. A large majority of Christians say all (21%) or most (65%) of their close friends are Christian. Christians also are almost universally married to other Christians, and they are uncomfortable with the idea of their child marrying a Muslim or Jew. Roughly nine-in-ten Christians say they would be “not too” comfortable (9%) or “not at all” comfortable (79%) with their child marrying a Jew, and eight-in-ten (80%) say they would be uncomfortable if a Muslim married into the family. 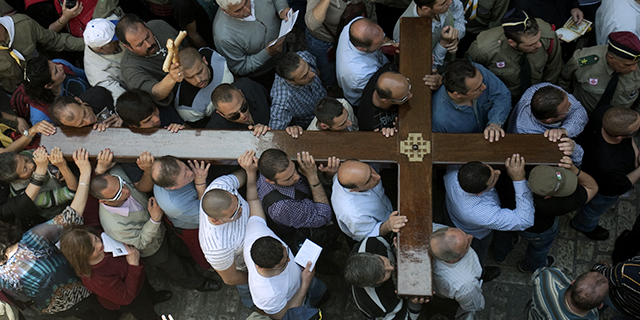 5 Certain religious practices are very common among Israeli Christians. For example, an overwhelming majority (94%) of Christians in Israel say they have been baptized. Majorities also say they have icons of saints or other holy figures in their homes (81%) and that they have been anointed with holy oil (83%) – a ritual performed annually or in case of illness. A majority (60%) say they fast during Lent. Tithing – that is, giving a percentage of one’s income to the church – is less common among Christians in Israel; 39% say they tithe.